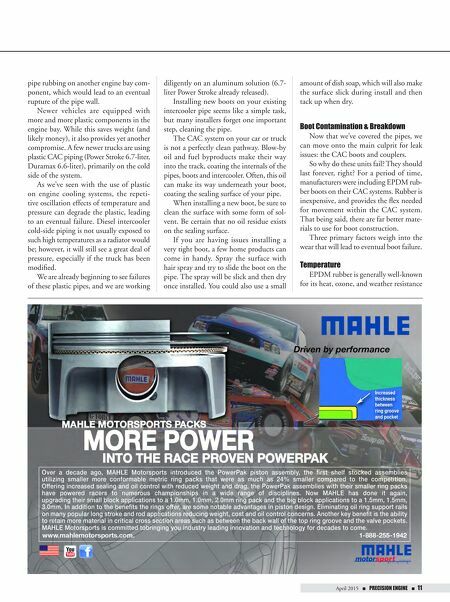 90 n Performance & Hotrod Business n April 2015 10 n PRECISION ENGINE n April 2015 PRECISION ENGINE undetected CAC leak could go unnoticed for some time, costing gallons of fuel. A pinhole leak or split boot is a ticking time bomb for a car or truck. That small leak is prone to spreading, resulting in the complete rupture of a boot. Any form of boot failure is going to cost you money one way or the other—money that could have been better spent on upgrades! You should also consider the long- term effects of running your vehicle with a leaking system. The first would be tur- bocharger wear or failure. The engine still expects a particular amount of boost, regardless of any leaks within the system. If the leak is cutting boost, the turbocharger will be forced to work harder to produce the necessary amount. This will increase wear on internal bearings, and will also introduce greater heat into both the CAC and coolant systems. This is not something you want. A simple $100 boot kit replacement could prevent thousands of dollars being spent on parts and labor to repair the damage. So, how do you find leaks in your sys- tem? Some leaks may be difficult to detect, especially if they have been present for quite a while. You should perform an initial inspec- tion to check all the boots in the system for wear and splits. Flex each boot in your hand and check for any damage in the bends. Also check for any rubbing damage incurred by other engine bay components. If no leaks are found, check all clamps to ensure they are tight and secure. Finally, a CAC boost leak tester can be used to provide confirmation of proper sealing of the system. Most shops should have this tool. Check online for DIY boost leak testers. A bunch of awesome build guides exist that utilize components found in any hardware store, saving you quite a bit of money. The basic function of these kits is simple: the system is capped from both ends and the piping, boot, and cooler are exposed to a specific air pressure. Once filled, it is easy to see the pressure quickly drop if a leak exists in the system. A small loss in pressure over a longer period of time is normally acceptable. With all of this in mind, if you have any doubt in your CAC system, take the time to perform an adequate inspection and test of the system. If anything, your peace of mind is certainly worth it. 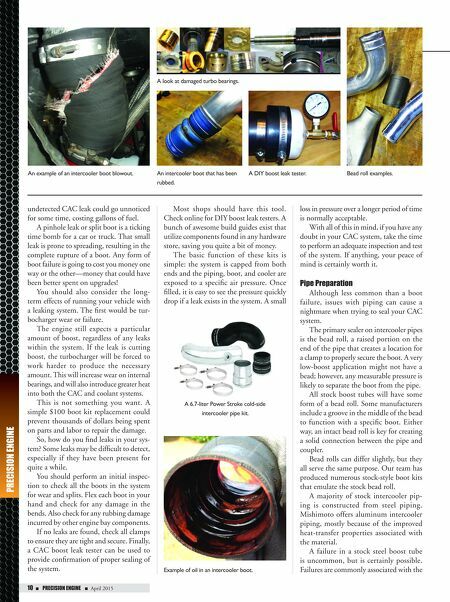 Pipe Preparation Although less common than a boot failure, issues with piping can cause a nightmare when trying to seal your CAC system. The primary sealer on intercooler pipes is the bead roll, a raised portion on the end of the pipe that creates a location for a clamp to properly secure the boot. A very low-boost application might not have a bead; however, any measurable pressure is likely to separate the boot from the pipe. All stock boost tubes will have some form of a bead roll. Some manufacturers include a groove in the middle of the bead to function with a specific boot. Either way, an intact bead roll is key for creating a solid connection between the pipe and coupler. Bead rolls can differ slightly, but they all serve the same purpose. Our team has produced numerous stock-style boot kits that emulate the stock bead roll. A majority of stock intercooler pip- ing is constructed from steel piping. Mishimoto offers aluminum intercooler piping, mostly because of the improved heat-transfer properties associated with the material. A failure in a stock steel boost tube is uncommon, but is certainly possible. Failures are commonly associated with the An example of an intercooler boot blowout. A look at damaged turbo bearings. An intercooler boot that has been rubbed. A DIY boost leak tester. Bead roll examples. A 6.7-liter Power Stroke cold-side intercooler pipe kit. Example of oil in an intercooler boot.